OSADL is offering a service to help manufacturers comply with license obligations of products that contain Open Source software. The logo is registered as trademark and will be established as a cachet. Suppliers of board support packages and other Open Source software providers may then print the logo on their products and use it as a hallmark of certified license compliance. Dr. Till Jaeger, Certified Copyright and Media Law Attorney, OSADL General Counsel, jbb Rechtsanwälte, Berlin, Germany. Travel expenses and accommodation may be allocated separately. VAT may need to be added, if required for a particular country. Should an audit fail and a delta re-audit is needed to issue the certificate, the fee will be determined individually based on the effort. 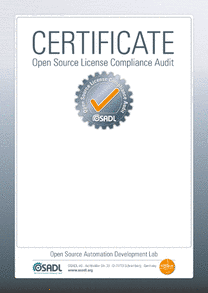 Please write to the OSADL Open Source License Compliance Audit Group, if you would like to get any more details or to directly order an audit.